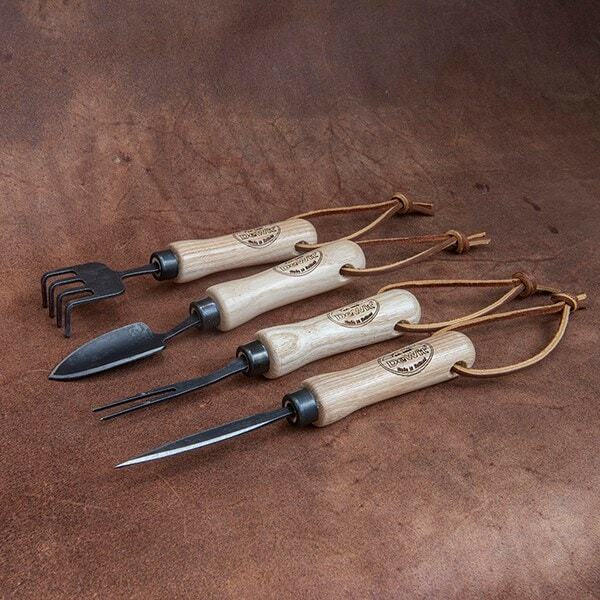 Buy De Wit small propagating tools: <ul><strong><li>Forged carbon steel with solid ash handles</li><li>Presented in a wooden gift box</li><li>Lifetime guarantee</li></strong></ul><br>This handy tool box contains four mini hand tools that are the perfect size for working with delicate seedlings and young plants. 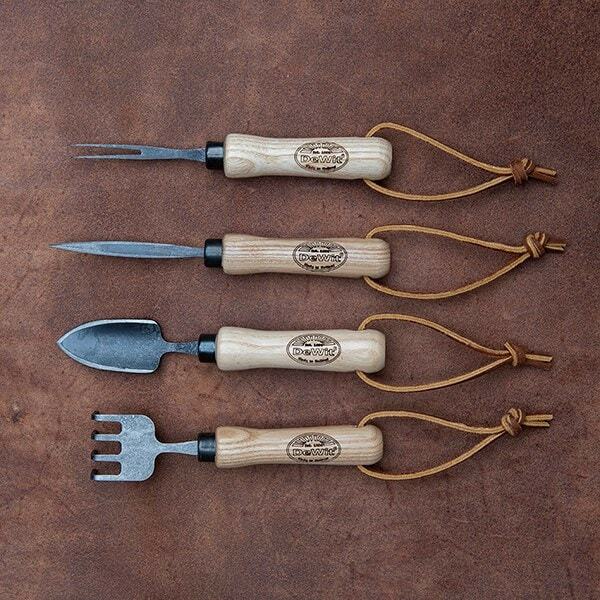 Also makes a great tool kit for bonsai.<br><br>Forged in the traditional way, the tools are built to last from carbon steel and fitted with solid ash ergonomic handles for a secure, comfortable grip.<br><br>The set includes:<ul><li>Greenhouse trowel - suitable for houseplants, seedling trays and potting.</li><li>Greenhouse 2-prong fork - ideal for bonsai, houseplants and herbs.</li><li>Greenhouse rake/scraper - perfect for removing moss from pots</li><li>Greenhouse knife - great for delicate cutting, creating holes, pricking out seedlings.</li></ul><br>The tools are presented in a beautifully crafted wooden storage box which makes a perfect gift for any keen gardener.<br><br>Measurements:<br>The length of the four tools ranges from 16cm to 20.5cm.<br><br><strong>About De Wit tools</strong><br><br>The Dutch are renowned for making the world’s finest garden tools, and De Wit is the most respected name of all. Founded in 1898, the family-owned toolmaker combines old-fashioned quality and craftsmanship with innovative design to create superior tools that last a lifetime.<br><br>Every tool is hand-forged in the Netherlands from tough boron steel - shaped, sharpened and burnished for durability, giving it the same blackened patina as traditional Edwardian tools. Each is fitted with an FSC-certified solid ash handle for ultimate strength and shock resistance, oiled to provide first-class protection against the elements.<br><br>All De Wit tools come with a lifetime guarantee against manufacturing defects, making them a truly once in a lifetime purchase. 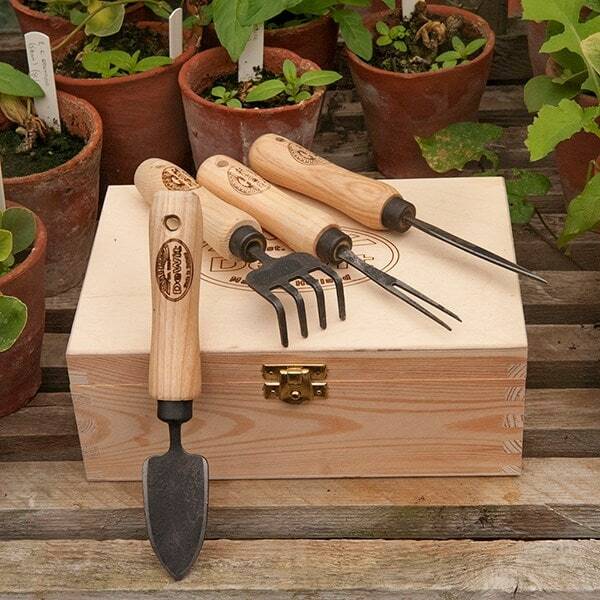 This handy tool box contains four mini hand tools that are the perfect size for working with delicate seedlings and young plants. Also makes a great tool kit for bonsai. Forged in the traditional way, the tools are built to last from carbon steel and fitted with solid ash ergonomic handles for a secure, comfortable grip. Greenhouse trowel - suitable for houseplants, seedling trays and potting. Greenhouse 2-prong fork - ideal for bonsai, houseplants and herbs. Greenhouse knife - great for delicate cutting, creating holes, pricking out seedlings. 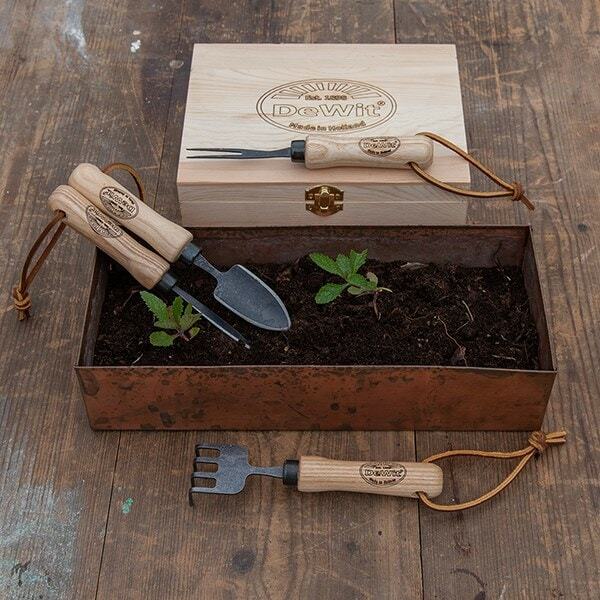 The tools are presented in a beautifully crafted wooden storage box which makes a perfect gift for any keen gardener. The length of the four tools ranges from 16cm to 20.5cm.